It's been another busy week here with my two favourite toddlers. 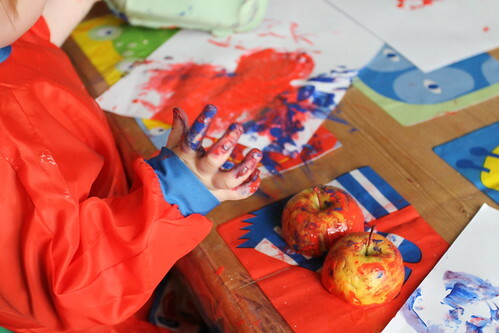 I thought we'd try apple printing. I thought the prints might be a good starting point for a Mother's Day card. 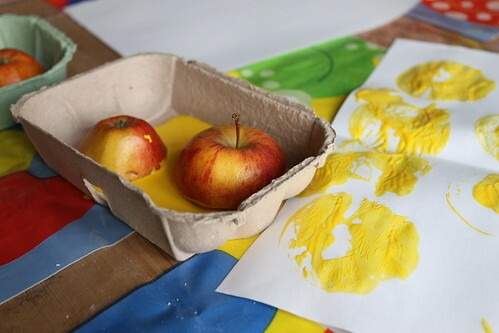 The top half of the apples were the boys favourite because the stalk made them easy to handle. 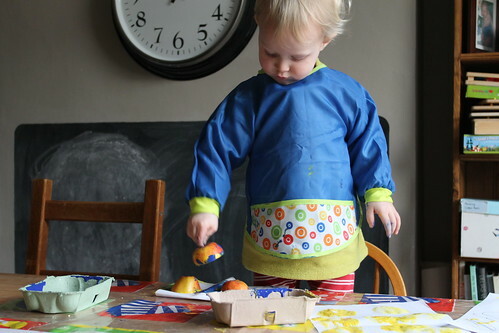 I should have known though, that despite my plans for nicely printed shapes, toddlers generally have their own ideas, and pretty quickly the printing became splodging and splashing and squidging. We also tried using various combs in paint. 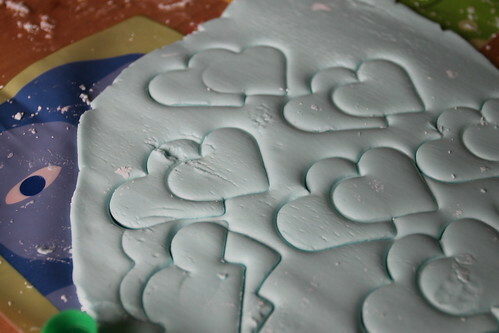 I cut out some heart shapes in card (second attempt at a Mothers Day card), dribbled paint on each shape and gave the boys combs to move the paint about. 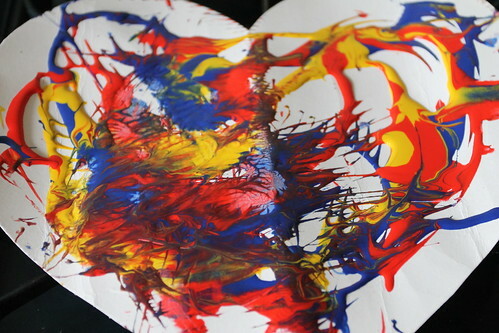 Ernest experimented with laying paper over each of his shapes and printing with the excess paint. 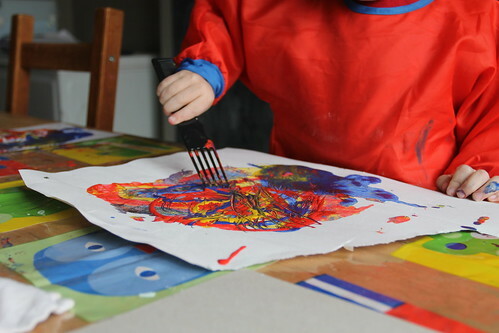 We had done this a week or so ago when he had poured paint onto the plastic tablecloth. He'd obviously remembered and had a great time today doing the same thing. 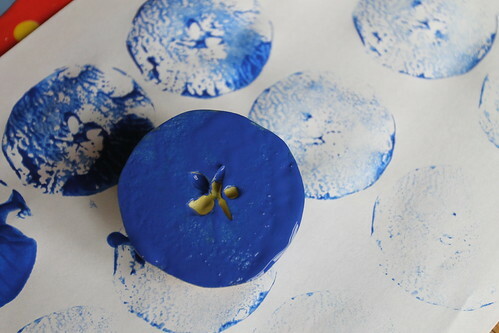 Unfortunately the paint on these may take a few days to dry, so Mothers Day cards will be late. 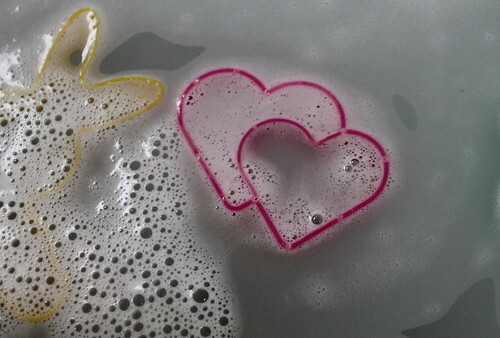 We've also experimented this week with bubble dough, a mixture of liquid soap and cornflour. 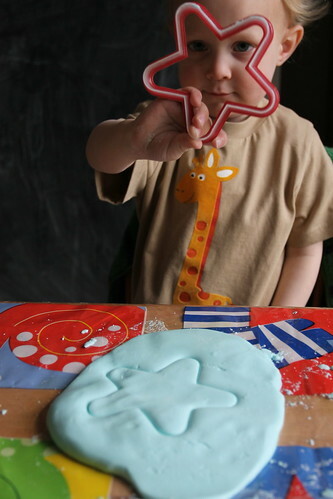 We used bubble bath, and just mixed it gradually with cornflour until we could mould it into a doughy consistency. The resulting dough is soft and silky to touch, and has an unusual texture. Ernest played happily with it all morning, and then again this evening. 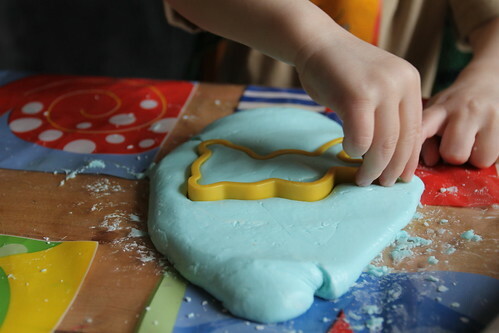 Ernest wanted to use his cookie cutters, but I'd say this kind of dough isn't ideally suited to that kind of play, it's much more of a sensory experience, though Ernest was very happy to roll it out and cut into it making patterns. My favourite thing about this dough is that it's mostly soap, so it's easy to clean off your hands and off any utensils, making a bubbly lather. 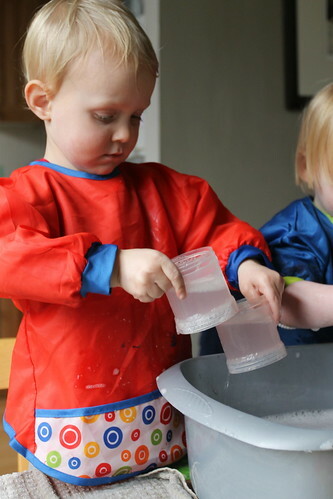 Washing up after any activity is probably Ernest's favourite way to keep busy. So even if things don't go to plan there's always the washing up! I don't recall getting more than 15 minutes of any 1 activity with Oscar at that age, so really it was quite successful I would say. We spent yesterday afternoon ripping pictures out of the old Next housewares book and sticking them down with mountains of glitter, and that is our mothers day crafting in a nutshell lol. You can't beat sticking and glueing with lots of glitter!! I need your bubble dough recipe!! pretty please?